We are connected with a well-known franchise, our employees receive top-notch training in carpet and flooring products. Check out your local carpet store and see everything we have to offer. We’re here to answer any questions you may have and guide you through every step of the process, from carpeting selection to carpet installation. Are you looking for a proven carpet weave? Try durable Berber carpet - which is available in abundance at our local carpet store and is good for high traffic. Made with uncut yarns that loop on the surface, our Berber is a unique style that is strong and hides dirt and soil. The pile height can be constructed low or high and made as a level or multi-loop carpet. Those who want to bring the great outdoors indoors love our Tigressa Carpets. 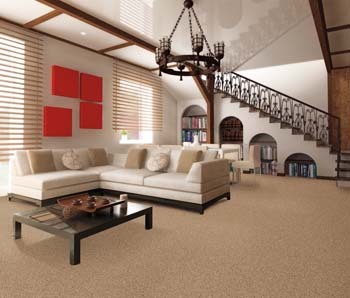 Tigressa Carpet is super soft and super smooth, with an eco-friendly appearance inspired by nature. Its dense fibers give it incredible durability, so you get great performance for a great price. Customers who want low maintenance can try our innovative Shaw Carpet, which has earned top ratings for design and durability. R2X Stain and Soil Repellant are incorporated into the design, so your floors stay protected from dirt. Do you have adults, children or pets in the home that are prone to spills and messes? Not a problem when you have Stainmaster Carpet installed - residential carpet flooring that is equally at home in a child's bedroom or a family room. Stainmaster resists stains, as its name suggests. Stainmaster Carpet has been the interior decoration of choice for busy families needing quality carpet since the 1980s. You shouldn’t have to choose between letting your kids or pets play on the floor and keeping your floor clean, and with our carpeting selections, you don’t have to. Brands such as Mohawk and Resista are designed to withstand spills, stains, and heavy traffic by combining durability with style and soft comfort. Resista Carpets are made for repelling liquid; just blot it away and that’s all there is to it! Clean up time will be a breeze, leaving you free to spend more time with your children and pets, who will appreciate the freedom to play. With some retailers, you might love the prices, but fret about the installation. Not so with us. We install what we sell, anywhere in a given store's service area. We also guarantee what we sell: our Ultimate Confidence Guarantee means that we stand behind our product, and will make it right if our product falls short of expectations. Likewise, our Price Protection Guarantee protects your interest: if you see the same brand and style of carpet flooring for a lower price within 30 days of purchase, we will make up the difference. Plus, our Assurance Guarantee lets you know that if you are not happy with your flooring during the first 30 days after purchase, we will replace it with a carpet of equal or lesser value. Carpet installation has never been easier or more affordable. We want to make your experience as pleasant and convenient as possible by taking the hassle out of home improvement with our low rates and quality carpeting installation. Visit our local carpet store to discover which carpet is right for your home or business. With so many types of carpet available, you’re sure to find the floor that suits your needs in looks, performance, and price. Stop in today and let us provide you with the carpet you’ve always wanted. Contact us to find out more about your flooring options. We’re happy to serve customers in Mount Pleasant, James Island, Johns Island, North Charleston, and Summerville, South Carolina, and surrounding areas.